Our proprietary processes have achieved commercial production of 30 highly purified recombinant cytokines and 33 monoclonal antibodies, currently sold to the scientific community worldwide. WE ARE THE COMMERCIAL SOURCE! Bulk quantity of 1 mg or more is available at extremely competitive prices. Bulk quantity of 50 - 1000 mg are available at extremely competitive prices. Process development including serum-free media optimization, mid-scale production and purification is also available. 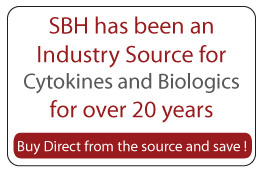 More information is available at Production of Biologics.